The MTmini sounds perfect for those with a limited budget and time. With just a simple webcam and a few software programs you can build your own multitouch device. Although this technique isn’t as elegant as IR applications it appears to get the job done. CUBIT is taking a unique approach by offering an open source programmable multitouch unit for sale. Their Touch Kit product comes in two flavors, Do It Yourself, for $800 and The Full Meal Deal, for $1480 with most of the hard work done for you. We couldn’t talk about multitouch without giving some mention of Apple. They deserve credit for bringing this technology to the masses through the iPhone. If recent patent filings are any indication, you can look for multitouch on your mouse and even the entire laptop interface in the future. Just last week Apple hackers presented Lux, a multitouch framework for OSX. How do they do multi-touch without a Camera? Is it possible to use the IR sensors from a mouse (ball style) or laser light sensors (from LED mouse) or would they not be powerful enough? A lot of these hacks seem to revolve around total internal reflection inside acrylic pains. Since the Wiimote includes a camera + software to track 4 separate IR points at one time, how does its accuracy compare to that of the webcams? Will it pick up the light that comes off these things? Since its designed to track IR, wouldn’t it be less work than writing apps for webcams? I’d love to see this on my desktop one day for multitasking. I think this could be the death of the mouse. Check out Johnny Chung Lee’s projects page at http://www.cs.cmu.edu/~johnny/projects/wii/ and scroll down to “Low-Cost Multi-point Interactive Whiteboards Using the Wiimote”. That should give you an idea of how well it works. i dont have any experence with software but i want to build an array of leds that suround the monitor. on set sending light the other reciving light. these leds would make a grid. 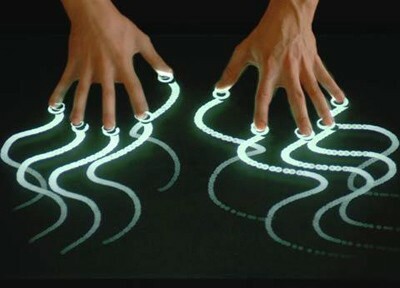 as your finger breaks the light the grid calcuates the possition of your finger and uses it for the input. hard ware build is simple the concept is simple enough implimetation is the part i dont undersand. yet. any ideas?? Sure, I’ve seen johnny’s work. Thats what inspired my question. Can the hacked cameras compare to a wiimote? If the cameras pick up an external light source, how sensitive will they be to it? And finally: Why bother implementing big algorithms to track location when the wiimote has that built in? By freeing yourself from big fancy stuff like that, this stuff can eventually make its way into robotics and hobby electronics. All you need is a bluetooth enabled platform, a bit of code, and your ready to roll. The hardware end seems to be on a good roll, but I haven’t seen that much software that supports muti-touch. there should be more detailed info about the software end. @camerin: yes that’ll work but it’ll be *very* low-res, even with dozens of LED/detector pairs. I have an old Tektronix 1281 logic analyzer that uses that exact concept for its on-screen menuing. It does work, but not for multitouch, and not for any kind of decent resolution. The multi-touch display that I’ve played with (made by Enthought) had an IR camera and could track 50 points at a time through clever software. If tracking more than four points at once is important then a wiiMote just won’t cut it. and say Microshaft spent billions in research for that and there is Open source solutions -sub 100$ material cost- working. Microsoft spent it’s money coming up with a “high resolution” interface device (1280×960 according to wikipedia), developing a complete user interface including finished applications that interact with other devices, and marketing it. They also probably spent money on building an SDK so that other developers can write software for it, a hefty fee on legal services in order to avoid infringing patents (or at least to avoid the appearance of patent infringement), and I’m betting they also set aside a good chunk in case a lawsuit actually was filed. I am curious about how the resolution of the open source products stand up against Microsoft and Apple. A little healthy competition might force them to turn their respective technologies into more than just expensive, and fairly frivolous, toys. I’m going to go hide from the impending fan-boy attacks now.